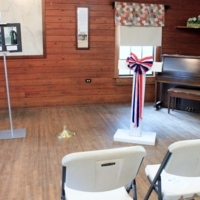 The stage and podium at the Geneva Community Center in Geneva, Florida. 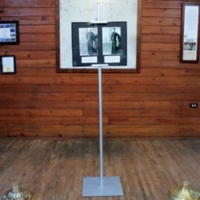 Three stands holding up several framed photographs line the stage from the left side to the center. 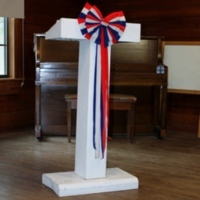 On the right of the stage is a white podium with a red, white and blue ribbon. Cravero, Geoffrey. 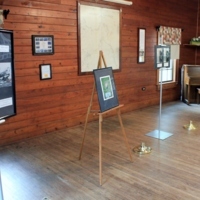 “Stage and Podium.” RICHES of Central Florida accessed April 21, 2019, https://richesmi.cah.ucf.edu/omeka/items/show/10415.